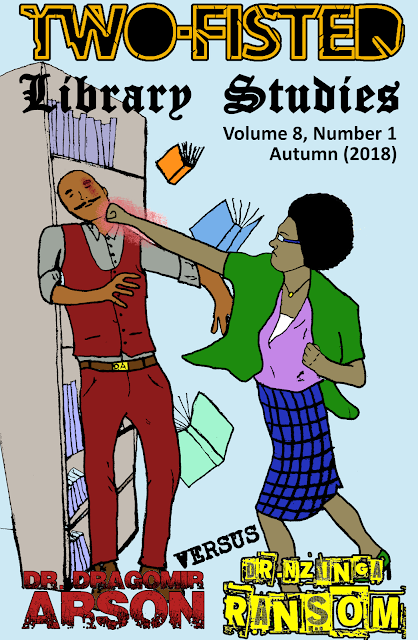 Weird Library-Science #9 now available! After a successful launch at Grid Zine Fest in Salt Lake City issue #9 has been added to our Big Cartel store! 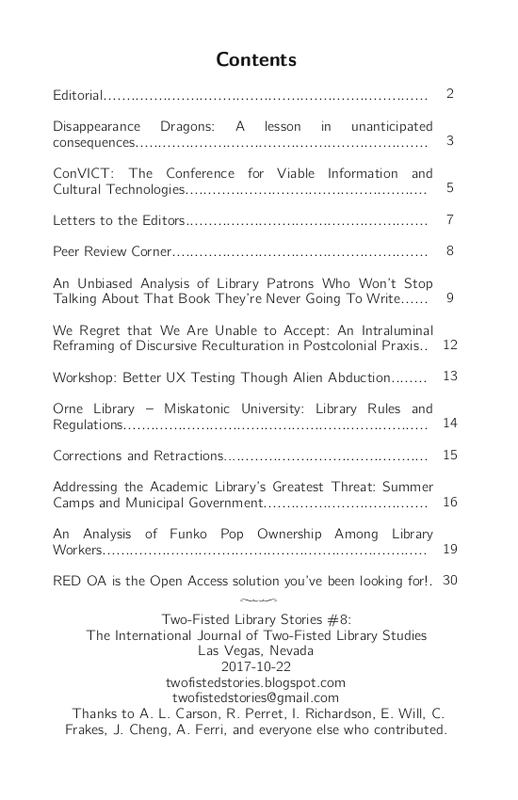 We've also updated the Issues page with a list of the libraries that seem to have copies in their collections. Two-Fisted Library Studies for sale in Quimby's in Chicago. 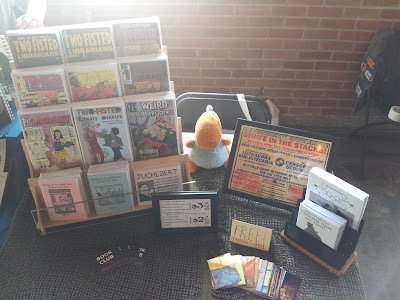 Our table at Grid Zine Fest. If you're interested in submitting, please email twofistedstories@gmail.com. Currently submissions are only open to women to create parity in those who are published. Deadline for Weird Library Science extended to January 31st! There's still time to submit to Weird Library-Science (issue #9 of Two-Fisted Library Stories)! 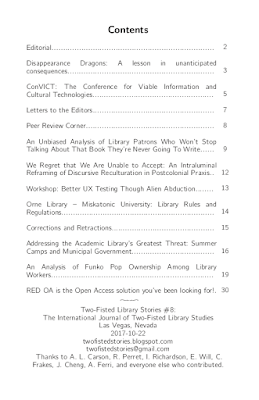 The International Journal of Two-Fisted Library Studies is available now! Yes! It's true! The new issue of your best (and only) source for hard-hitting library research is now available! 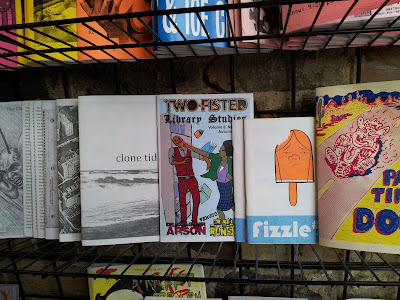 You can purchase it (and every other issue of Two-Fisted Library Stories) from our Big Cartel store. What's inside? Well, here's the table of contents! You can find the data related to "An Analysis of Funko Pop Ownership Among Library Workers" here. It contains responses from 382 people, and the data about age and work place setup might actually be of use to real research. And don't forget! 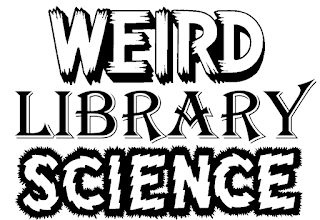 The deadline for the next issue (Weird Library Science) is December 31st! Here's a photo from when PHX Zine Fest, the first time Two-Fisted Studies was available! 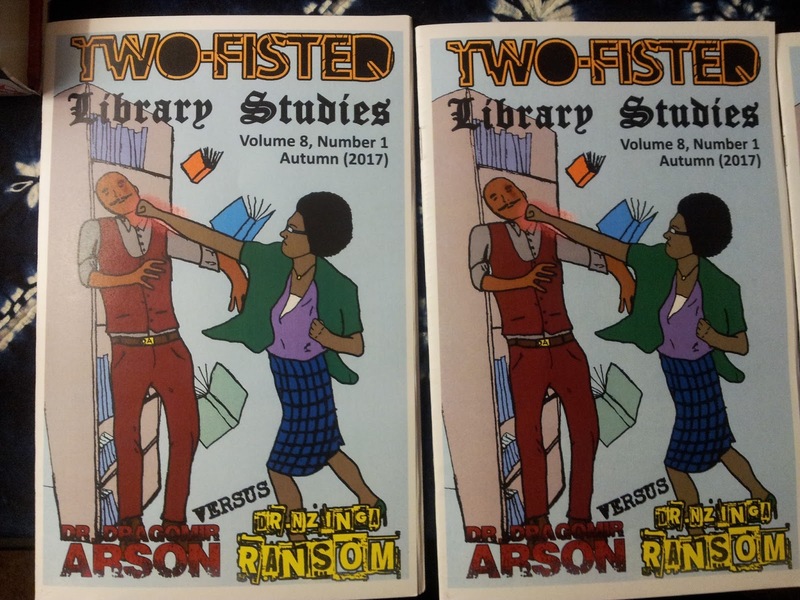 Here's the Cover to Two-Fisted Library Stories #8: The Journal of Two-Fisted Library Studies! The editors have, at one time or another, won the World Heavyweight Library Championship, the Mixed Tag Team Library Championship, the Atomic Library Association Championship, and the Theresa Elmendorf Memorial Library Battle Royale. They are willing to take on any Library Adversaries anytime and anywhere. There's still over a month to submit! The deadline is September 1st. More info about submissions can be found here. Etsy changed how their store system worked, so we don't have a store there anymore. However, we now have a store on Big Cartel! We've simplified the products available and hopefully it makes sense. If you have any questions please email twofistedstories@gmail.com. Foolish Earthlings! 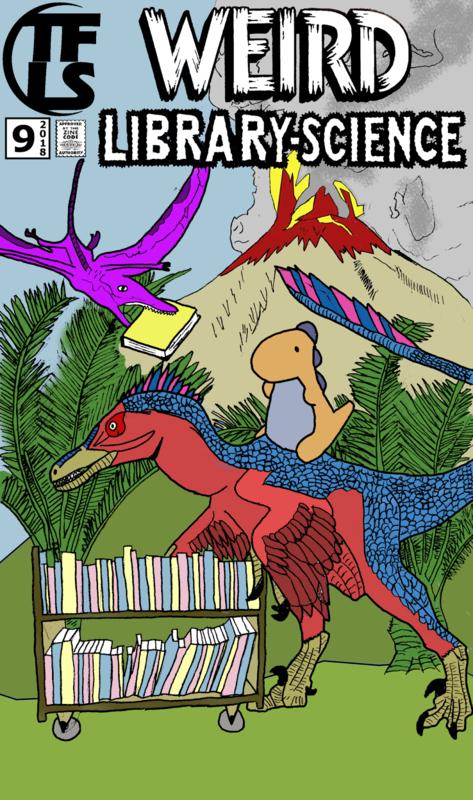 You will SUBMIT to Weird Library Science! Foolish Earthlings! You will SUBMIT! The fate of your very planet relies on you creating enough GLOW (Galactic Library Oriented Wisdom) Power to defeat the evil BEIGE (Book-Eating, Information-Grinding Entities). How do you create GLOW Power? Using your TOWERING imagination you must create the most ACTION-PACKED stories, comics, drawings, photographs, recipes, knitting patterns, phony letters, fake news items, bogus advertisements, made-up issue blurbs, and whatever else you can think of as long as it is filled with THRILLS, EXCITEMENT, and LIBRARIES. Mad science, weird fantasy, occult horror, spicy mysteries, noirish romances, intense adventures, and whatever else. 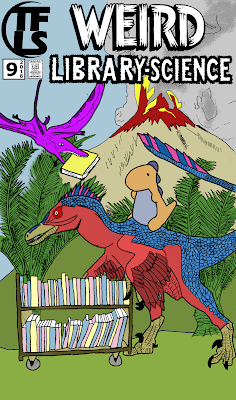 Stories can be about librarians, library technicians, library cats, sentient libraries, etc. Write about a library that uses ALIEN TECHNOLOGY, a cataloguing system so obtuse that it drives those that try to use it INSANE, or a library worker who has to track down a Nazi zeppelin in order to get an OVERDUE BOOK. As long as your contribution is somewhat library focused and filled with the requisite GLOW Power it's fine! So get out your typewriters, crayons, and drawing sticks (or whatever it is you Earthlings create with) and create something or the Earth you call home is DOOMED! Weird Library Science is the 9th (!) 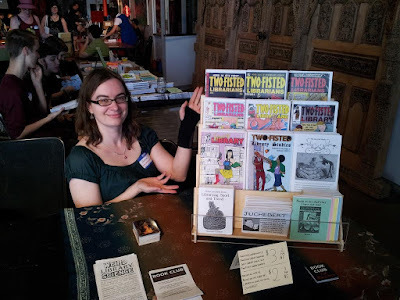 issue of Two-Fisted Library Stories, an anthology zine featuring pulp-inspired fiction, comics, and art created by you (hopefully!) concerning libraries and library workers. The Journal of Two-Fisted Library Studies is a formidable and indomitable journal that publishes the most POTENT articles, reviews, and research findings of interest to those working in the ROUGHEST and TOUGHEST libraries and archives in the world. Our intense editorial process ensures that only the most UNYIELDING and TENACIOUS authors will have their content reach the publication stage and become CONQUERORS OF SCHOLARLY COMMUNICATION. We believe that only the strongest publishers can survive and that it is only natural that some publishers will prey upon others. We do not intend to be prey. We fully support scholarly Openness, for which reason we allow anyone to purchase our publications. Our commitment to Openness extends to describing our editorial process, in excruciating detail and in print, including exactly what we think of our submitters, their writing style, ideas, and personal grooming. For a nominal fee, we will omit this information from the publication.